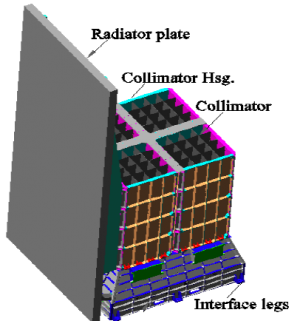 ASTROSAT will carry a hard X-ray imager in the form of CZTI. It will consist of a Pixellated Cadmium-Zinc-Telluride detector array of ~1000 cm2 geometric area. These detectors have very good detection efficiency, close to 100% up to 100 keV, and have a superior energy resolution (~2% at 60 keV) compared to scintillation and proportional counters. Their small pixel size also facilitates medium resolution imaging in hard x-rays. The CZTI will be fitted with a two dimensional coded mask for imaging purposes. The sky brightness distribution will be obtained by applying a deconvolution procedure to the shadow pattern of the coded mask recorded by the detector. The CZTI will be fabricated in four identical, independent quadrants which will be joined together in the final configuration. Each quadrant will have a 64x64 element coded mask and a detector array of the same number of pixels. The mask pattern of adjacent quadrants will be rotated by 90o with respect to each other. CZTI assembly with the radiator plate. All four quadrants are seen in the figure, as also are the collimator slats. The coded mask (not shown) will be placed above the collimator housing. The height of the radiator plate is 110 cm. It is thermally connected to the detector chip by heat pipes in order to achieve passive cooling to about -20oC at which the CZT detector module will be operated. Detail of the base section of the CZTI assembly on which the collimator housing sits. Accommodation for the radioactive calibration sources (alpha boxes) are seen. A gap of 10 cm between the bottom of the collimator and the detector plane allows the calibration sources to illuminate the whole detector. The bottom part of the base section contains the veto layer and the detector electronics. The dimensions marked are in mm.